To really connect with consumers, brands can no longer present a facade and sell. To thrive, brands need to create an emotional connection with people, stemming from a clear brand purpose. A purpose that addresses a real societal issue and that strives to create a movement to resolve this issue. 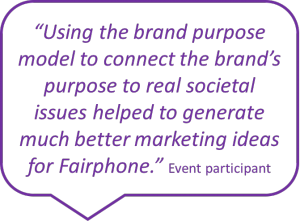 In May 2017, we organized an event about purpose marketing at Fairphone, a social enterprise that makes the world’s first ethical, modular smartphone. The event was organized by the Nyenrode Business University Alumni Circle for Sustainability, in collaboration with the Alumni Circle for Marketing & Digital. Here are some of the key outtakes from the event on purpose marketing. Lina Ruiz, Fairphone’s strategic partnerships and events manager, kicked off with an introduction to Fairphone’s mission: making a positive impact in how phones are made, used and recycled. Interestingly, she used a video by Milton Friedman to explain the complexity of supply chains. She then shared Fairphone goal of creating positive social and environmental impact from the beginning to the end of a phone’s life cycle. They do this in four ways. 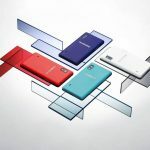 Fairphone’s long-lasting design creates products that last and that are easier to repair. The design helps people understand how to get more years out of the device and move away from the mindset that consumer electronics are semi-disposable objects. Fairphone traces where the parts come from and therefore creates demand for fair materials that are good for people and planet. One material at a time, Fairphone strives to increase awareness and source better ingredients for their devices. Fairphone wants to improve working conditions in the electronics sector. With experts, NGOs and other partners, they develop innovative programs to improve worker satisfaction and representation. To progress towards a circular economy, Fairphone encourages the reuse and recycling of electronics. With spare parts and recycling programs, they support both consumers and producers. Consumers are increasingly oversaturated with advertising messages. Brands constantly try to sell themselves with beautiful messages, but not all of them are authentic. No wonder the Edelman Trust Barometer shows an implosion of trust in business. At the same time, people look to business to be drivers of change for a better society. From brands, people demand something they can relate to, authenticity and higher ethical standards. The brands that succeed are therefore those that offer shared value for both society and business. That have a purpose that truly connects their business to societal issues in a relevant way. Some companies, like chocolate maker Tony’s Chocolonely and transportation company AirHunters, had a clear societal purpose from the start. Tony’s wants to abolish slavery in the cocoa industry. Airhunters wants to decrease the carbon footprint and congestion caused by suboptimal transportation. Their brands, therefore, radiate their respective purpose very clearly. Other older and larger companies, like Unilever and Heineken, seem to have veered further from their original purpose but are redefining purpose for their brands with great success. Year on year, Unilever’s purpose brands like Dove, Lifebuoy and Ben & Jerry’s, outgrow the other brands by 30%. And Heineken’s responsible consumption campaign with DJ Armin van Buren created a global movement of DJs urging people to dance more and drink slowly. Using the purposeful positioning model developed by strategy agency The Terrace, the participants then got to work on Fairphone’s positioning. 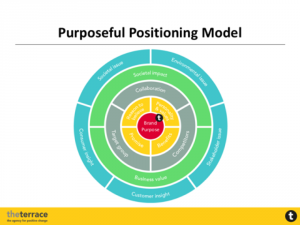 The model helps companies and brands find their purpose through an outside-in approach. What are external societal issues that a brand can or should address, such as environmental problems, social issues, latent consumer needs, stakeholder issues and true customer needs? Through the lens of those key issues, how can a brand create shared value? Where are the opportunities for impact or societal value? And how can it create business value in parallel? Who are the people to engage and keep in mind? Through the shared value angle, who are the people that will use the brand? With whom would the brand compete? And which parties are potential collaborators striving for the same societal value? What does the brand really stand for? What are the brand’s key benefits, personality, promise and the reasons to believe? This is often more comfortable territory for the marketer. Why is the brand really here? What is the brand’s true purpose? The heart of the model brings together the input and perspectives from the previous steps. Once that purpose is distilled and chosen, then go back from the inside out to refine all elements in the model. Combining the forces of Nyenrode’s sustainability and marketing alumni and their guests, the group came up with various alternate business models. Each stemming from a different angle on the purpose that Fairphone could adopt. Therefore each leading to quite different engagement strategies and tactics. The conclusion of the evening was that there are many opportunities for Fairphone to further focus its purpose and marketing tactics. Even with limited time, the group came up with very actionable ideas, which were gratefully received by the Fairphone team. The other conclusion was that crafting purpose takes more time than the 30 minutes we had available in the context of this workshop – and that is was incredibly inspiring for all involved! Over drinks, the participants continued to talk for hours, sharing how they could put more purpose into their own brands and lives. A big thank you to Fairphone for hosting this event, to the many people who participated so actively and to the many people involved from the Nyenrode Alumni Circles for Sustainability and Marketing & Digital. Interested in finding out more about purpose marketing, please contact Marjolein. This blog was written by Marjolein Baghuis (@MBaghuis) and Tim Mazajchik (@tmaz85) for the Nyenrode Alumni website. It has also been posted on the websites of The Terrace and Heartbeat Strategy. To read about interesting people, book reviews and other posts about sustainability, change, and communications please subscribe to the Change in Context blog.